In the early 1980s, NBC was at the lowest point in its history. Its shows were not only low-rated, but they were achieving that status completely on merit: they stank. How bad? "Supertrain," "The Misadventures of Sheriff Lobo," "Pink Lady and Jeff" bad. Come 1983, the network had a relatively new chairman, in place for two years, who'd started in the job by declaring that NBC would get to the top by dropping that dross and producing truly worthy entertainment -- "First be best; then be first," he'd said. But that strategy had not paid off. NBC had exactly zero shows among the top-20 rated on television. Most embarrassing, one of its new offerings was so thoroughly rejected by the national audience that it had finished dead last among the 77 network shows in the ratings one week. Many network executives in the chairman's position would have been desperate to be seen to be doing something and would have cast aside that last place show. But that chairman, Grant Tinker, was not an ordinary executive, and he knew the show, a comedy about some barflies in Boston, was not ordinary either. If he wanted to show he really meant what he said about quality, he had to keep it on the air. So he did. And later, after his faith in it paid off, he would sum up his feelings about that first season by saying, "I don't want to live in a country where 'Cheers' finishes last in the ratings." Tinker, who passed away in California this week, had already achieved great success as head of the fabled MTM production company -- which he'd co-founded with his then-wife, Mary Tyler Moore -- when he agreed to assume control of a desperately failing NBC in 1981. The impact he made with "Cheers" is well known even to those who don't follow the television industry. After showing some gains in its second season it finally exploded into mass popularity after NBC introduced "The Cosby Show" in 1984 and everything on the network's Thursday night lineup soared. 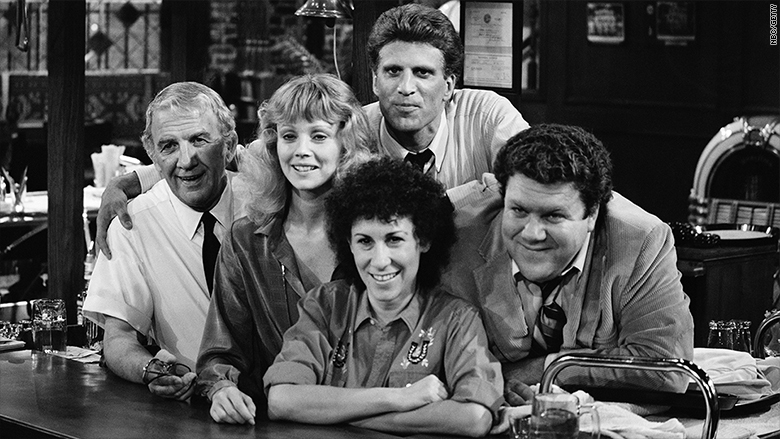 "Cheers" eventually rose to be the number-one show on television, becoming -- as far as I know -- the only series ever to rank last one week and go on to be first later in its run. Less well known is the indelible mark that Tinker left on television in his years running MTM and then his five years as chair of NBC. He was a creature the business had not previously encountered: A leader who believed in commercial television as legitimate art form, not as a cash register disguised as a projector. Tinker cared about the profit part, for sure. He was proud to say he -- with the inestimable help of his programming genius partner, Brandon Tartikoff -- helped turn NBC into a money geyser in the late 1980's. And he was never happy that in order to take over NBC he was compelled to divest his interest in the MTM production company (conflicts of interest were taken seriously in some quarters back then) and thus lost tens of millions when the hugely successful company sold out later. But he had a genuine faith in audiences inevitably appreciating quality in entertainment, a view some deemed quixotic for a boss laboring in a "mass" medium -- widely considered for most of its existence to be the low-rent section of the entertainment world. Tinker's transformation of NBC did more than spur an era of extraordinary success for that network, it effectively changed the NBC brand. Forever after, expectations for NBC were simply different: They were supposed to be the "quality network," much as CBS had been the so-called "Tiffany network" in the medium's early days. Tinker was a rare executive who genuinely stood for something, and stood by the people he put in place to do that something. That was especially true of Tartikoff, who was only able to gain the legendary reputation he attained because Tinker would not fire him when managers of NBC's affiliated stations insisted on that action after Tinker and Tartikoff's first season together had resulted in every new series being cancelled. After Tartikoff appeared before the managers and pled his case, Tinker followed and went to his programmer's defense against a torrent of complaints. Tinker knew what they didn't: That Tartikoff had made his pitch after weeks of chemotherapy for a recurrence of Hodgkin's disease and was sitting outside the room still wearing a wig and fake eyebrows he had taped on. Tinker believed Tartikoff was still the man to rebuild NBC. He was right. Television today is awash in great entertainment, literally too much for most viewers to take in. That isn't all because Grant Tinker proved people will watch great shows every bit as much as they will watch sludge. But some part of it is.